If you like lemon and a soft, cake-y cookie then these are the perfect for you! The flavors are perfect way to celebrate Spring! I served these at work recently – and several coworkers were raving about them. I may have had a few of these for lunch that day – hey, they do have ricotta cheese, so they are healthy – yeah, I’ll convince myself to believe that! :) Definitely don’t be put off by the ‘ricotta’ cheese, it’s definitely there for the texture and not the taste. 1. Preheat the oven to 375 degrees F. Line two baking sheets with parchment paper. 2. In a medium bowl, combine the flour, baking powder, and salt. 3. In the bowl of an electric mixer beat the butter and sugar on medium-high speed until light and fluffy, 2-3 minutes. 4. Add the eggs one at a time and mix well to incorporate, scraping down the bowl between additions. 5. Add the ricotta cheese, the lemon juice, and lemon zest. Mix to combine. 6. Add in the dry ingredients and mix on low speed just until incorporated. 7. Spoon the dough onto the baking sheets (about 2 tablespoons per cookie). Bake for 15 minutes one tray at a time, until slightly golden at the edges. Remove from the oven and let the cookies rest on the baking sheet for 10 minutes. Transfer to a wire rack to cool completely. 8. 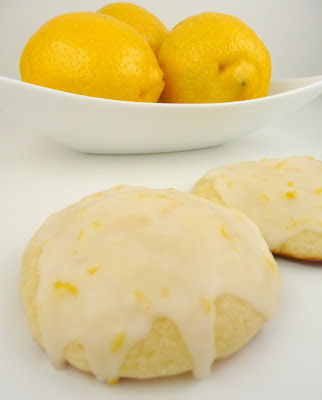 To make the glaze, in a small bowl combine the powdered sugar, lemon juice and lemon zest. Whisk until smooth. Spoon a small amount of glaze onto each cookie and spread gently using the back of the spoon. Let the cookies sit to allow the glaze to harden, about 2 hours. Store in an airtight container in a single layer. i've been dying to try these! they look so good!